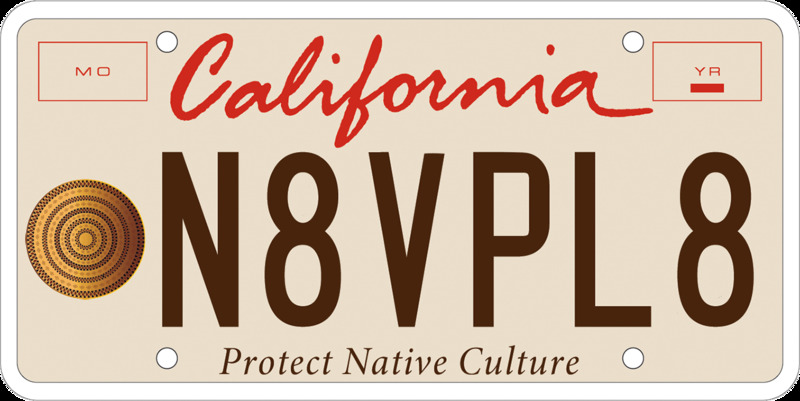 Welcome to the California Native American Heritage Commission License Plate Website! Revenue from the plate, known as the “Protect Native Culture” ™ plate, will support programs of the California Native American Heritage Commission (NAHC) that preserve and protect California Native American cultural resources such as Native American ceremonial sites, ancient Native American burials, Native American artifacts or human remains taken from Native American graves, and Native American historic and sacred sites, among other Native American cultural resources. The Protect Native Culture™ Plate will also fund implementation of the California Native American Graves Protection and Repatriation Act (CalNAGPRA), which provides a legal process for California Native American tribes to secure the return of the human remains of their ancestors held by California universities, museums, and government agencies for scientific study or other purposes. License Plate Program ongoing administration costs. Initial plate subscription fee = $50; annual renewal subscription fee = $40.